You recently asked me to keep you up to date with IAM NZ training progress. I sat my check ride on Thursday (the pre-full membership test)under the eagle eyes of the Chief Examiner and passed! Write-up is here:Write up from Geoff . As always, thanks so much for the long-distance support in the shape of your videos which are incredibly good value. First of all may I thank Nigel for giving up his time, coming along and giving us talk and presentation which was informative and entertaining. I`d also like to thanks him for the goodie bags and for the donation he made to Walton Hall School which you will not have known about. It was a great evening with all the usual banter and slurs being thrown around but nothing being meant by it unless it was directed at Mole, Phil, Me, Edward... and it was an even bigger shame that Dave Hall couldn't make it because of emergency in pub kitchen leaving water flowing everywhere. The real reason why he was missed is because he had the biscuits! Thanks one and all for supporting the club and wanting to learn more, we never finish doing that. See you at the next ride out which Phil Hems has volunteered to lead. Hi, Great vid, i can see the logic of haveing 5 tracks rather than 3 which is what I﻿ have been using, will now try the 5 tracks. Its will smoothe out the conering and should be less braking. Brilliant! @3213089 Well done = Keep me posted...Are you happy﻿ with gear selection and balance of the throttle? @advancedbiker Yeah, been using this for a bit now, just makes the ride, gear change and throttle control﻿ so much smoother and relaxing. With the correct road position gives me the safest line in and out of the corner also the best view for any on coming problems! Brilliant. 'Hi All, it has fallen to me to report on the GRD from last Sunday (16th) so here with a short note to report on the ride. One word adequately describes the day EXCELLENT! top notch roads, top notch scenery (when going slow enough to see it all!) and a top notch group. 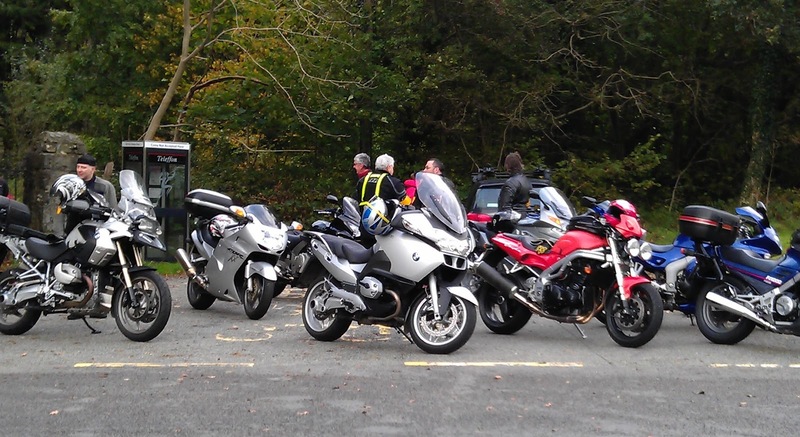 Well done Chairman John on leading us through some of the best riding roads in Wales and nice to see such a good turn out for the last GRD of the season. Nine riders rode out from Eccy fire station on what looked like it might be a wet one but apart from some light precipitation in the odd spot it remained dry. The nine included a surprise but welcome appearance of Nigel Bowers our friendly local ROSPA examiner who came along for the ride. Good to see you Nigel and I hope you enjoyed it as much as we did. We headed out and after a brief period on the boring stuff to get us round the other side of Telford the fun started and didn’t stop till we got home some 240 miles later. Our route took us via Much Wenlock, Craven Arms, Clun, Newtown , Machynlleth (for lunch), Llangollen, whitchurch and then home. As you can imagine with JC leading the route did not stick to the A roads and many "off the beaten track" B roads where taken to maximize the enjoyment. A brilliant day was had by all. To top it all we even learnt a thing or two like the benefits of "radio assisted overtaking" now that does add a whole new dimension!!!! Thanks again to one and all and I for one can not wait till the next one, get those radios charged JC! To end just a reminder - we have our second club talk by Nigel at the fire station coming up on Thursday 27th of October, meet at 19.00hr kick off at 19.30 sharp. 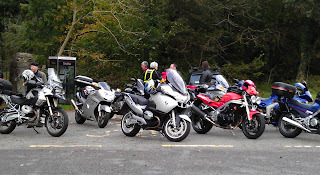 You can see me in Motorcycle News, out Wednesday 19th October 2011 following a one day assessment course I did with Alison Silcox in the Peak District.